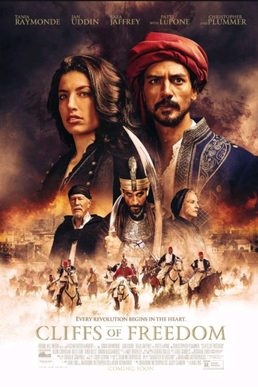 Cliffs of Freedom is a 2019 film that tells the story of an ill-fated romance between a young Greek village girl and a conflicted Turkish officer during the dawn of the Greek War for Independence against the Ottoman Empire in 1821. It was directed by Van Ling and co-written by Marianne Metropoulos, Van Ling and Kevin Bernhardt, based on a novel by billionaire philanthropist Marianne Metropoulos titled Daughter of Destiny. It stars many notable actors, such as Tania Raymonde, Jan Uddin, Raza Jaffrey, Patti LuPone, Billy Zane and Christopher Plummer. Though the film seems to do the best it could with its resources and is well-intentioned, as the first Hollywood production to film a movie against the backdrop of the Greek Revolution, it was a bit disappointing. I didn't buy the love story between a Greek peasant girl and a kind-hearted Turkish officer, which furthermore from an historical perspective is blatantly absurd. The acting was pretty good throughout, but often stiff and forced to show the national Greek spirit of the time, though I would say it fails to do so. There are too many historical details to name that are troublesome. The look of the film is cheap, though the night shots improve it. The script itself is historically complicated for someone with little to no knowledge of the Greek Revolution, and production would have done well to set the historical context of the film with an introduction or prologue before it started. My overall impression is that the film tries to be more of a Hollywood Greek-American version of the Greek Revolution than anything authentic, even though it is technically an independent film. It has long been a dream of mine to write a script about the Greek Revolution, but it would have to be more simple, subtle and authentic. Personally, as a first film about the Greek Revolution, I think a film about the last years of Lord Byron would have been much better and subtle in its storytelling. The cast would have to be primarily made up of real Greeks from Greece, except for Lord Byron of course. And the budget would have to be sufficient enough for excellent cinematography. Relying on a cheesy unrealistic love-story, melodrama, and a big battle scene like Cliffs of Freedom does is just old cliche, overdone, and weak. Too many important historical tales with an important message do this, and people have little to no interest in them. They go back to a time when such tropes were popular in Hollywood, like the 1950's and 1960's, but today more substance is required. Cliffs of Freedom, as I said, is well-intentioned, and is made with a sense of Greek national pride, but it will only mean something to people with a Greek background, thus limiting its audience and missing a great opportunity of bringing the heroic struggles of the Greek revolutionaries to the masses. I don't regret seeing it, I just wish it was better.